It’s easy to find your place in the sun at Grand Caribe Belize! Grand Caribe Belize is a beautiful, modern resort on the Caribbean Sea. 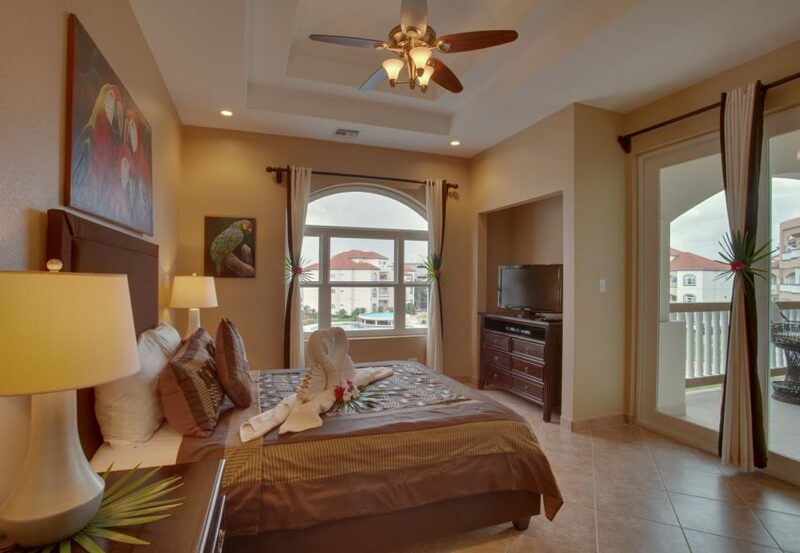 Located in the tranquil north Ambergris Caye area, Grand Caribe is about 2 miles from charming downtown San Pedro. The unique layout of the resort offers extraordinary panoramic ocean and pool views from each of the 80 luxurious condominiums. Each one, two, three or four bedroom condo is spacious, beautifully furnished and features a fully equipped kitchen. Grand Caribe Belize has some of the best Ambergris Caye accommodations consisting of eight individual buildings in a semi-circle with 500 feet of white sand beach facing the Caribbean Sea and the world’s second largest barrier reef. Each condo has a panoramic view of the turquoise water and is literally just steps away from 3 swimming pools, a beautifully appointed pier, and the ocean. Each spacious unit is individually owned and uniquely furnished with everything you need to feel at home. Every condo has a fully equipped kitchen and each bedroom has its own bath. EVOO euro bistro- The one and only Gin House in Belize, EVOO, provides exclusive imported Gins & Tonics in addition to European favorites such as Kir Royal, Nigroni and Sangria. One-bedroom/one-bath condos are located on the third floor; offer approximately 1000 square feet of living space and verandas with spectacular panoramic views of the Caribbean. All have central A/C, fully equipped kitchens, 2 flat-screen TVs, iPod docking stations, DVD players, cable TV, wireless internet and room safe. This condo has a Queen size bed. Available in Ocean View, Ocean Front, Ocean View Superior, Ocean Front Superior, Beach- Walkout, Luxury Ocean View, and Luxury Ocean Front. Two bedroom/two bath condo offers 1500+ square feet of living space and a private balcony with panoramic views of the Caribbean Sea. This condo offers 2 queen size beds, fully equipped kitchen, 3 flat screen TVs, Ipod docking stations, DVD player, cable TV, iron & Ironing board, 2 hairdryers, wireless Internet and room safe. The three bedroom/three bathroom condos are over 2300 sq ft with living area and 2 bedrooms /2 baths and a spacious veranda on the 3rd floor with panoramic views of the Caribbean Sea. The master bedroom and bath are on the 4th floor and has its own veranda with yet another spectacular sea view. Interior units have views of the three pools and beautifully landscaped grounds in addition to ocean views. All units have Fully equipped kitchens, 4 Flat screen TVs, Ipod docking stations, DVD players, Cable TV, Iron & Ironing board, 3 hairdryers, Wireless Internet and Room Safe. The condo available offers a 1 king, 1 queen and 2 twin size beds. The four bedroom/four bathroom Penthouse is over 3,600 square feet including dining room, living room and a large wet bar on the main floor in conjunction with a Grand veranda, hosting panoramic views of the Caribbean sea, three pools and beautifully landscaped grounds. Each bedroom has its own spacious connecting bathroom. Three of the four bedrooms are on the upper level and include their own private verandas, two with sea views and one with a lagoon view (great for sunsets). These units have Fully equipped kitchens, Wet bar, Living room, Flat screen TVs, Ipod docking stations, DVD players, Phone Cable TV, Wireless Internet, Room Safe and is Elevator accessed. This condo has 1 king and 6 twins. Twins can be joined to make it a king size bed. Look no further for an unforgettable vacation on Ambergris Caye. 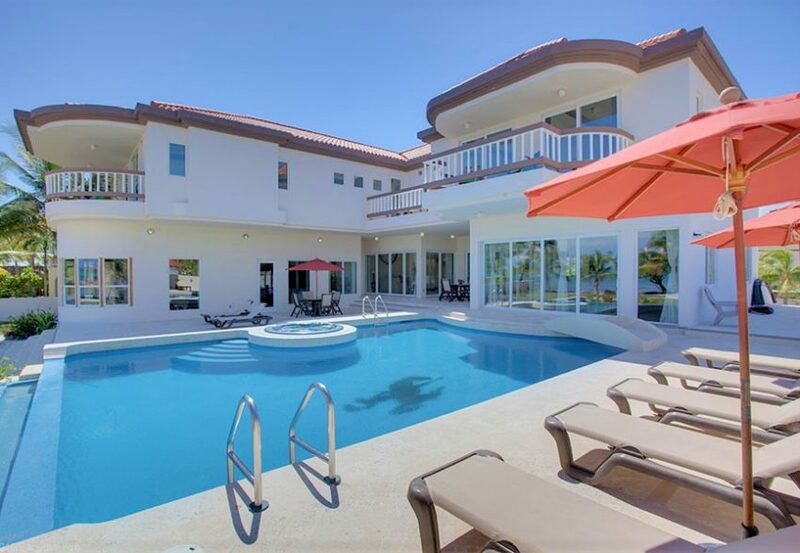 This beachfront vacation home is located on a beautiful and private beach area of North Ambergris Caye and offers all the conveniences to make it your home away from home. It has 7,500 square feet of living space plus an additional 3,500 square feet outdoor entertaining area. Experience the ultimate in privacy and luxury amidst tropical surroundings. 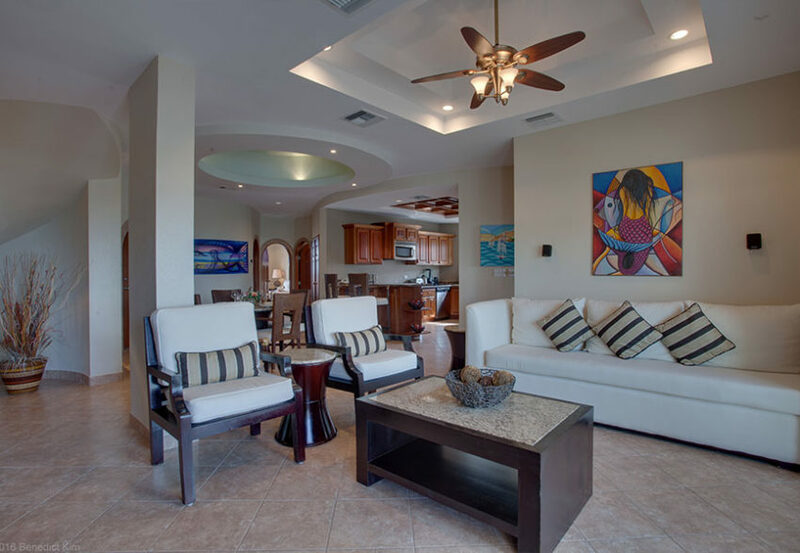 Enjoy spectacular views of the Caribbean Sea and Barrier Reef from the living room, kitchen and bedrooms. 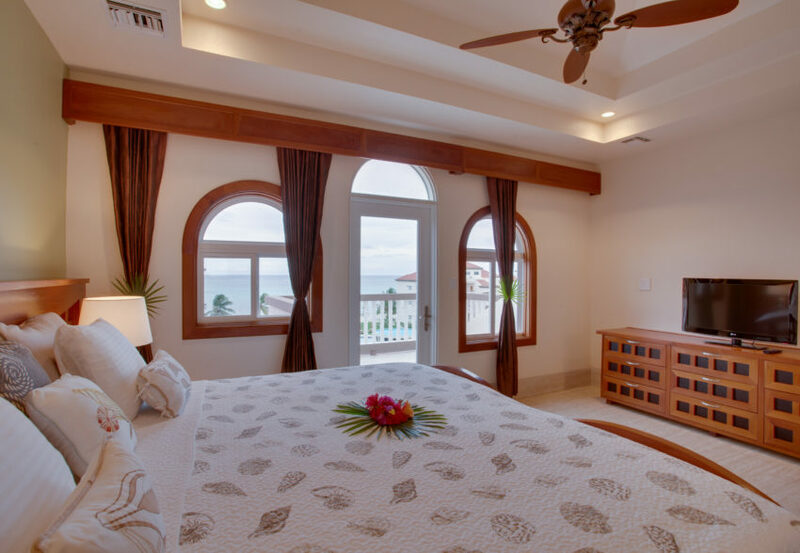 This elegantly decorated beachfront vacation home is furnished with a mix of imported and locally designed furniture using Belizean Mahogany and other indigenous hardwoods. 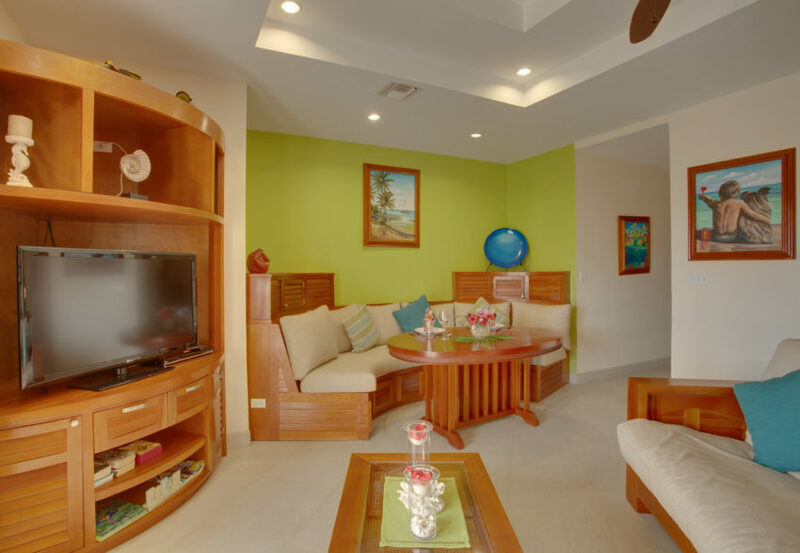 A stylish interior and three entertaining areas make it a perfect place to unwind and relax during your Belize vacation.